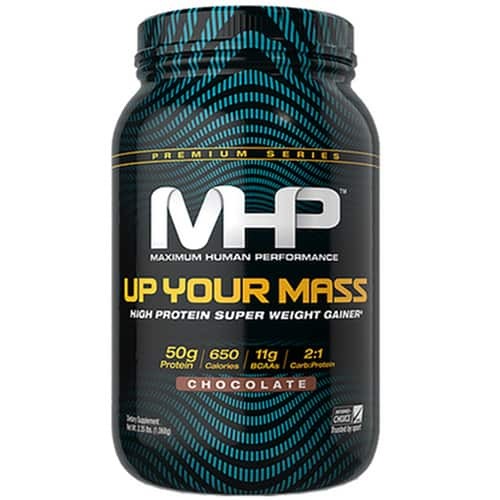 Gaspari Anavite Powder is a sports multivitamin that can protect your health and help you workout harder so you can lose fat, build muscle and accomplish your goals faster. Unlike other products that contain a mere ‘sprinkling’ of a few popular ingredients, the nutrients and dosages it contains are those shown to be effective in scientific studies. I’ve used it myself for the last 3 years and continue to do so today because its benefits are so significant. While I (your author, Curt)was quite content getting my daily dose of Anavite in tablet form, Gaspari has a new version that I’ve switched to because it’s much more convenient. This new version of Anavite Powder is an updated formula that comes in an orange flavored powder that you can mix in water. It mixes dissolves easily and has a very refreshing flavor. I’d compare it to Tang or Sunny D orange drink. This review covers everything you need to know about Anavite Powder, from its key ingredients and benefits to how to take it for the best results. After reading this review, I think you’ll be ready to give it a try too. What Are The Key Ingredients In Gaspari Anavite Powder? – Several studies show this nutrient, beta alanine, helps to ‘buffer’ your muscles from fatigue so you can workout harder, longer. When taken daily, studies also show it can help you build muscle, lose fat, and get stronger. Taking 2 servings of Anavite powder daily provides you with over 3 grams of Carnosyn beta alanine. This is the amount and type used in the aforementioned studies. 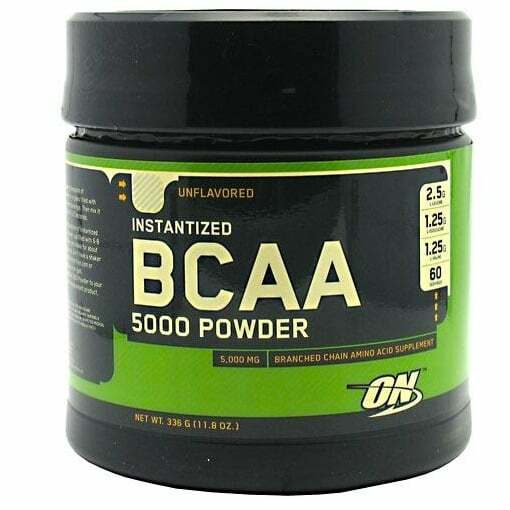 – This amino acid can increase your endurance, decrease post-workout soreness, and benefit your overall health. The key to getting these benefits is to use the right amount and type of carnitine. Anavite makes it easy by giving you 2 grams of l-carnitine tartrate, the dosage and type found to be effective in every daily serving. 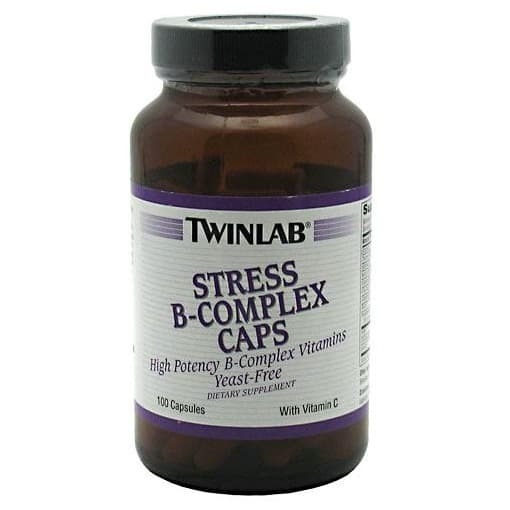 – This vitamin plays a role in 100’s of bodily functions. Studies also show that people with the highest levels of vitamin D in their blood perform better in the gym and their chosen sports. Every serving of Anavite Powder contains 1000 IU of vitamin D3, the best absorbed form available. This is the amount recommended by many health experts. – The process of chelation binds an amino acid to a mineral such as magensium, selinium, and zinc. 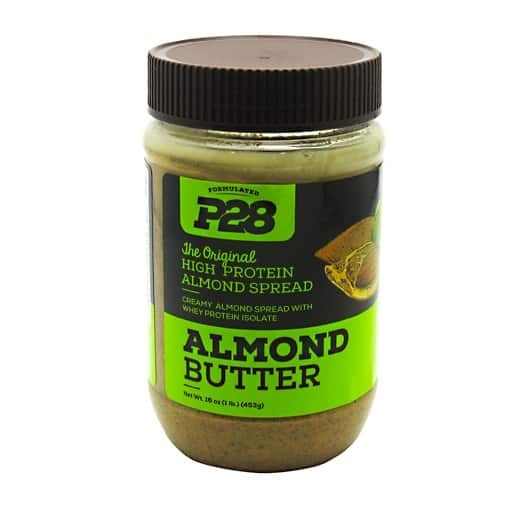 This enables your body to more easily absorb the minerals and therefore receive more of their benefits. The minerals used in Gaspari Anavite Powder are all from Albion, the leader in the manufacturing of chelated mineral supplements. – Every serving is loaded with the vitamins your body needs to perform its best and stay healthy. This includes B vitamins, beta carotene, vitamin C, and even vitamin K.
Who Should Take Anavite Powder? This sports multivitamin is for men and women that work out hard to build muscle, lose fat, and achieve their best health. Whether you are a gym rat,Crossfitter, or just like to lift weights and do cardio 3-4 times a week, its ingredients can help you achieve your goals. If you are a guy or girl that hates to swallow pills Anavite powder is for you too. 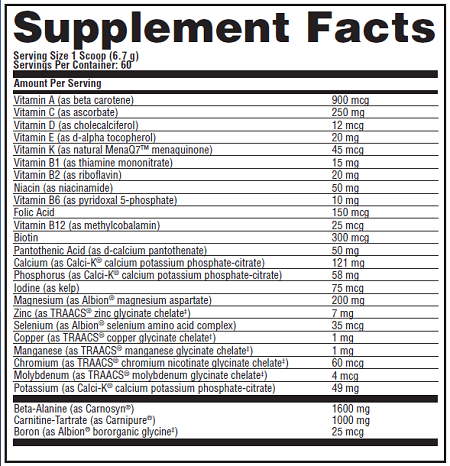 Each serving (1 scoop) contains the same nutrients as 3 tablets of Anavite. How Should I Take Anavite Powder? The best way to take it is to follow Gaspari Nutrition’s recommendation which is to mix 1 scoop in 8 ounces of water and drink with a meal. Taking it twice daily will help you get the most benefit as this provides the dosages of each nutrients that’s shown to be most effective. If you take it as recommended and are working out regularly, expect to notice less soreness post-workout and the ability to do more reps with heavier weights. These results may take 2-3 weeks to really kick in so you’ll have to be a little patient. When I first started taking Anavite Powder I noticed that I was less sore after workouts after about 3 days and that my workout endurance improved after 2 weeks. Does Anavite Contain Artificial Colors? No, there are no artificial colors used in this product. It does contain natural flavors and a little bit of Aspartame and Sucralose as sweeteners. 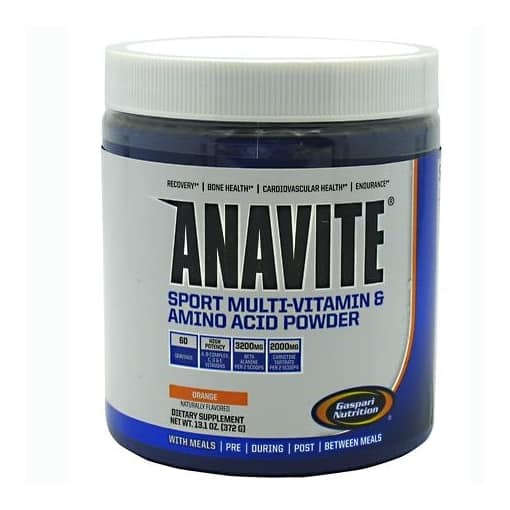 Gaspari Anavite Powder is sports multivitamin that packs 3 supplements (beta alanine, l-carnitine, and a multivitamin/mineral) into 1 product. No other multivitamin contains so many nutrients in effective doses making it the best of its class, hands down.